A 48-year-old shipyard welder was welding on a barge that was undergoing renovation, working from an elevating work platform. A pinhole leak developed in the hydraulic lines on the lift, and the escaping hydraulic oil was ignited by sparks from the welding operation. The worker was taken to a burn unit, but later died. 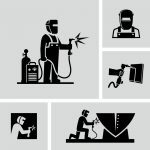 Whether you’re a large, heavy equipment manufacturer with a stable of experienced welders or a small job shop where welding equipment is used infrequently, odds are you use the same type of equipment: a metal inert gas (MIG) welder.